Add flavour with our new Cooks' Ingredients range - this risotto uses carnaroli rice for a wonderfully creamy dish that is ready in 30 minutes. Soak the mushrooms in 300ml warm, previously boiled water for 20 minutes. Strain through a sieve, reserving the liquid. Roughly chop the mushrooms and the pancetta, reserving 4 slices. In a large saucepan, melt the butter with the oil, then stir in the onion, garlic and chopped pancetta and cook for 3-4 minutes until the pancetta is golden. Add the mushrooms and cook for 2-3 minutes, then add the rice and cook for 2 minutes, stirring. Pour in the wine and cook until the liquid is absorbed, then stir in the mushroom liquid and cook until this has been absorbed. Season with freshly ground black pepper. Add the hot stock, 125ml at a time, stirring constantly, until most of the liquid has been absorbed. Cook until the rice is tender but firm to the bite. Preheat the grill to high. Place the remaining pancetta slices under the grill and cook for 4 minutes until crispy, then break into large pieces. 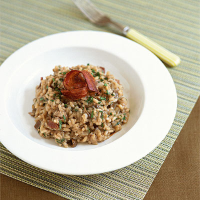 Stir the parsley and Parmigianno Reggiano into the risotto. To serve, place in soup bowls and top with the grilled pancetta. If desired, drizzle with a little Waitrose Cooks' Ingredients Truffle Infused Extra Virgin Olive Oil and top with rocket leaves. Keep the stock hot by simmering it in a saucepan next to the risotto. If you need a little more stock, just add boiling water.